Exclamation points end sentences! But in Audrey’s case, an exclamation point started her story and her relationship with Children’s Miracle Network Hospitals. 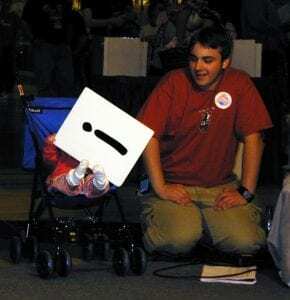 Audrey was just a baby when we asked her (with the help of her buddy, Andrew) to help hold up the exclamation point at the 2003 Children’s Miracle Network Hospitals Telethon at the Bangor Mall. Audrey who needed life saving care at EMMC immediately after she was born rocked the exclamation point back then, and Friday night, 16 years later, Audrey rocked it again. This time, she was putting the stamp on John Bapst’s Crusade for the Kids, her high school’s first Dance Marathon. Through the years, Audrey has shared her story at Black BearTHON, the Telethon, and at Marriott’s Root Beer Float Day, but this year she stepped out of her comfort zone. She, along with her friends, Rachael, Lauren, and Hunter, took the lead in planning Crusade for the Kids, and the smile on her face when she saw the 8 in $8,344.17 reveal was a moment we’ll never forget.